Even though they were just down the road in Lakeland, Tyler and Kristyn wanted to get away to get married. They contacted Victoria with Intimate Weddings of Orlando and explained that they would just have their son, two parents and grandmother at the ceremony and Victoria suggested an elopement package at the Celebration Lakefront. Tyler arrived first with their son and spent some time with Edmund Rhodes of Rhodes Studios for a few pictures with his son, as they enjoyed the air conditioning on this warm day. When Kristen arrived everything was set up for a first look along the lakefront. 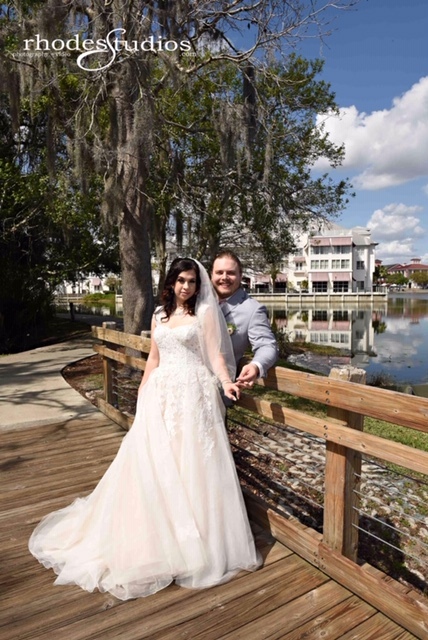 After that first look the couple decided they wanted a more shaded location, so around the hotel to the nature trail and they found the perfect spot. Rhodes Studios captured so many beautiful images from this intimate affair. From that first look though the ceremony, and some portraits after the ceremony, Edmund captured it all. Rev.Glynn Ferguson with the officiants of Sensational Ceremonies acted as minister for the ceremony. He worked with them to create a custom ceremony, that fit the two of them perfectly. He asked them to write and say why they love each other. Kristyn wrote: Why do I love Tyler? I don’t need a reason to love Tyler, I love him simply because he is him.He is honest, loyal,faithful, caring, kind , he provided me with the two greatest gifts I could ask for his love and our beautiful baby boy. He is my balance and he is my world, my everything. Tyler wrote: Not a fan of homework, and that question never has a simple answer and it’s never the same. Currently we live together and love each other, we have a child that we are raising together that makes us even stronger. we are looking to add one more to our troop but that wont happen for another year or so. I love kris because she is old fashioned and honest, a nice complement to my stoic stature and loyal heart. because i have been hurt before like many others i hesitated to go further with her or even open up to her at all, but as time goes on honesty shows, a good natured person appears before me, hearts grow and feelings flourish. I feel she is right for me and our future together and i intend to stay with her till death no matter how many times she nags me to pick up ferret poop. I most certainly love her with all my being and i believe she feels the same. Congratulations Kristyn and Tyler. We wish you happiness for a lifetime as you walk this journey through life together. Powered by Carbon-Neutral Data Centers.